The town of Ramnagaram lies in the state of Karnataka. Presence of lush green surroundings and mountains makes this town a tourist's delight. This town has been featured in different movies because of which it has become more popular. The best season to visit the town of Ramnagaram is the winter season that falls in the months of November to February. The weather during this season remains cool and pleasant, with the maximum temperature being 33Ã‚Â°C. Different adventurous activities such as rock climbing or trekking can be enjoyed during this time. This town can also be visited during the summer season or the monsoons depending upon the person's personal choice. Heavy rainfall is experienced during the monsoon season while summers are harsh and hot. The season may be any, depending on the people's choice. They should remember to carry all the required things to enjoy their stay at Ramnagaram. Care of small children and aged people, if travelling along, should be taken. November to February- The winter season is the best time to visit the city as weather during these months’ remains very pleasant. The temperature ranges from 29°C to 18°C during this season. April to July- During this season the temperature during the day can reach up to 35°C, making the weather hot and harsh. Tourist generally prefers to avoid this season while planning their trip. July to October- Heavy rains are experienced during these months. Trekking should be avoided during this time as the hills and rocks become slippery due to rains. Rain lovers can visit the city during this time. Cold Throughout the month of January the climate remains cold. Due to low temperature many days in the month of January are affected by foggy conditions. Different adventurous sports such as trekking or water rafting can be enjoyed during this time. This month is regarded as the best time for planning a trip to this town. Cold This month is the preferred time, for making an escape from the polluted air and congested streets of your city. In this town different outdoor activities such as kayaking, archery, rifle shooting can be experienced. The climate during the days remains pleasant while the nights can be chilling, therefore carrying of woolen clothes along is recommended. Moderately Cold The temperature begins to rise with the starting of this month. Nature lovers can visit the town in this month as rare bird species visit this region during this time. The moments like lighting a bonfire and sitting around it with your friends can be relished in this season. This is the last month of the winter season. Moderately Hot This month marks the beginning of summer season with the maximum temperature soaring up to 33Ã‚Â°C. A visit to different attractions can be enjoyed with friends or family members. This town is known as 'silk town' therefore visitors can indulge in shopping during this month and can get a closer look of the culture of the town. Hot This is the hottest month of the year and is avoided by a number of visitors. Summers of Ramnagaram are very hot. During this month different indoor activities can be enjoyed. Small children should not be allowed to stay in the afternoon sun for a long time as it can have bad affect on their health. Moderately Hot Occasional rainfalls are observed during this month which offers some relief from the summer sun. The temperature still remains high therefore different outdoor trips should not be undertaken during this month. Use of sun protection gear and sunscreens is necessary when stepping out in sun. Children should be involved in indoor activities only. Rainy With the beginning of this month, monsoon season begins. Heavy monsoon showers are experienced during this month. Trekking and other adventurous activities are not recommended during this time as the hills become slippery due to regular rains. 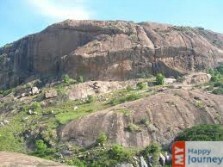 Rain lovers can plan their trip to this town in the month of July as Ramnagaram looks very beautiful in monsoons. Rainy With the onset of rainy season, a dip in the temperature is experienced. Weather during the days and nights remains equally pleasant. Due to heavy rains carrying of rain gear is important. Outdoor activities such as rock climbing or river rafting are not preferred by visitors in this month and care of children and aged people should be taken. Rainy With the beginning of this month, fewer rainfalls are observed. People who do not like rain should avoid planning their trip during this month. The weather is pleasant during this month because the rain helps in lowering the temperature. Landslides are commonly observed during this month therefore the month of September should be avoided while planning a trip. Rainy Temperature during this month remains cool due to frequent rainfall. Due to rains, indoor activities are preferred and a visit to the Janapada Loka which is the best museum in the town can be made. Species of birds can be seen as the hills of the town houses Long-billed Vultures which has now become an endangered species. Pleasant With the beginning of this month, the winter season also starts. Tourists in large number flock this hill station. Different tourist attractions can be enjoyed during this month. Various resort and hotel owners offer discounts to attract the attention of tourists. Visiting the town in this month can be a wonderful experience as the temperature is pleasant. Moderately Cold Temperature during this month can dip to a low of 12Ã‚Â°C making it the place of choice for tourists. Bird lovers should plan their visit around this time as different species of birds such as Long-billed Vulture, Egyptian vulture and Yellow-throated bulbul can be seen in this hill station. The hills of the town look very beautiful in the winter season.